True heirloom ‘Lazy Housewife’ pole bean was originally introduced by W. Atlee Burpee Co. in 1885. Were these pearls, what a necklace they would make. These are the true ‘Lazy Housewife’, originally introduced by W. Atlee Burpee Co. in 1885, which explains the antiquated moniker. 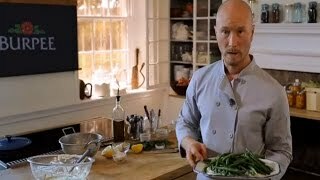 Plants bear green, entirely stringless pods of exceedingly fine, buttery flavor when cooked. When dried, the beans are perfectly round and white, like little pearls, with a heavier, richer, creamy taste. For longer cropping periods, greater yields, and easier harvesting, use a pole or trellis system. 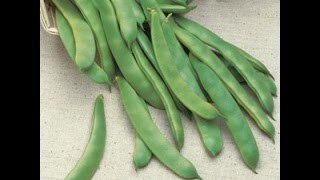 Pick them young for snap beans (80 days), or let them dry for shelling beans. Bean, Pole, Lazy Housewife is rated 3.4 out of 5 by 5. Rated 5 out of 5 by Force from Late Bean I started these beans in root trainers. Planted them out a little late (about 24 inches long!) They grew to about 5 feet with nothing on them. Be patient!!! When the weather cooled and they were up over my cattle panel hoop, they produced huge pods in late August. It's October now, and today I'm going out to pull the pods to hang to dry. They are Beautiful!!!! They mostly podded in Late August/early September Zone 8b. Rated 5 out of 5 by Ktfu from Season after season Love these beans. Mellow, green taste, and tender. Easy care. Rated 5 out of 5 by HeatherR39 from Easy to grow I planted late, like the middle of June. It's now August and there are lots of beans! They grew so big it broke my tressel and the poles but we hung them back up and put extra supports to keep them up. So excited about these delicious beans! Rated 1 out of 5 by Mbjorling from Poor germination Only one in 5 beans germinated 20%. I planted again 2 weeks later and about the same. It is beginning of August and the beans are starting to flower. Glad I have a neighbor who has enough to share. Rated 1 out of 5 by Boony from Lazy Housewife Pole Bean review Bought Lazy Housewife Pole Beans this spring (2018) planted them mid-May, they grew an arms reach over my head, looked healthy, had been blooming for 2 1/2 to 3 weeks and no bean pods on them! I looked one more time and found one pod on them that looked like a snow pod pea. I took every leaf off and chopped for compost then un-twined the rest from the trellis, I did not fine another pod.